The HAWK II is a free standing four season small packing expedition tent for use in all weathers. At Redverz, we like options. When factors like snow load and variable ground conditions demand a four season mountaineering tent Redverz has you covered. 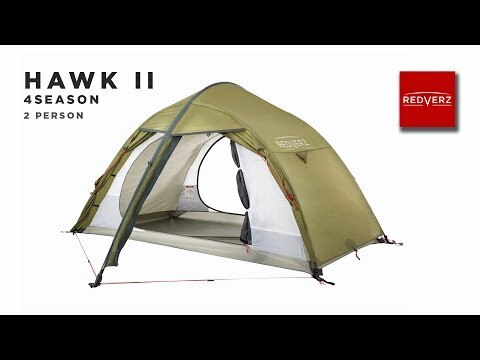 The Hawk II is a 2 person, 4 season, free standing mountaineering tent. Designed for year round use, the Hawk II is ideal for winter camping, backpacking, mountaineering and alpine conditions. Like all Redverz tent designs, The Hawk II comes with the inner sleeping bay already clipped into the outer fly. Set up, even in poor conditions, is flawless. The inner tent is shielded from the elements by the outer fly as the two are erected together in one step. The tent has two separate vestibules plus entry and exit doors at each end affording campers unfettered access to the tent and stored gear. Each vestibule has two panels which can be rolled back individually on either side or left completely open with both doors rolled back for maximum ventilation in sweltering conditions. Driving rain or snow? Cinch it all down for unbeatable protection against whatever Mother Nature throws at you. Top quality components and purposeful design ensure peak performance. DAC poles and pegs are strong, lightweight and dependable. A repair sleeve is included. YKK zippers are consistently reliable. Four pockets offer ample sleep area storage and if you need more an overhead gear loft is included in the price. We said we like options....this one is on us. Covered under a 2 Year Manufacturers Warranty. Designed to withstand extreme weather conditions and winter snow loads. Two separate entry and exit doors offer easy access. Two vestibules offer ample storage. Both vestibules open either partially for covered storage or fully for optimal ventilation in extreme temperatures. Sleep area comfortably accommodates two campers. Dome design allows for additional headroom. Custom footprint covers the entire tent length, including vestibules. The foot print is an optional add on. Ground sheets extend the life of your tent floor and keep gear clean. Moss green colour blends in with natural surroundings. Simple, three pole construction. Colour-coded poles and sleeves make for foolproof set up. DAC Featherlite aluminium, shock cord poles and DAC stakes deliver an unparalleled strength-to-weight ratio. Four inner sleep area pockets and a gear loft amp up organisational capabilities. Loft stores items neatly overhead and is included in the price of the tent Tent purchase includes guy lines with stow bags, stakes, stake bag, poles, pole bag, and tent stuff sack. Waterproof Redverz dry bags and a footprint for this tent are sold separately. Freestanding lightweight compact 2 person tent with generous vestibule. Fully geodesic (self standing) ultralight 2 person tent with room for gear. A popular long standing tent in the Khyam range, pop-up quick pitch structure, 2/3 man. A popular long standing tent in the Khyam range, pop-up quick pitch structure, 2/3 man. Sold here with an additional full length footprint. The Kyham Nimbus is a lightweight compact quick pitch, 2 man tent with room for gear. A fully geodesic free standing tent With Marmot's Volume Optimising Structure which maximised living space. A trimmed-down version of the best-selling Tungsten tent, the Marmot Tungsten UL 2P maximizes livability while making sure the weight caters for backpackers. For over 25 years the Voyager tent has been a favourite for backpackers and trekkers for year-round camping due to its aerodynamic shape and semi-geodesic design.